FIG. 7.22.3 Algal-bacterial interplay in an aerobic lagoon. FIG. 7.22.4 Anaerobic degradation process. to degrade cellulose, fungi are important in the biological treatment of some industrial wastes and in composting of organic solid waste. Compared to the research on waste degradation by bacteria, much less exists concerning the active role of fungi in waste degradation. Fungi are present in suspended-growth systems, but their role is not well known. In attached-growth systems, they are a major component of the biota and may be responsible for forming the base film to which other microorganisms attach. Most of the fungi that have been recovered from wastewater treatment systems are the imperfect stages of Ascomycetes. Microorganisms that can grow as either single cells; yeast; or as filaments; Candida, Rhodotorula, Oedidendron, Geotrichum, and Tricosporon; are common in waste systems along with many common molds. FIG. 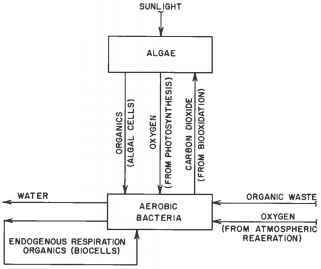 7.22.5 Daily cycle of algal activity related to net oxygen production. (Data from R.L. O'Connell and N.A. 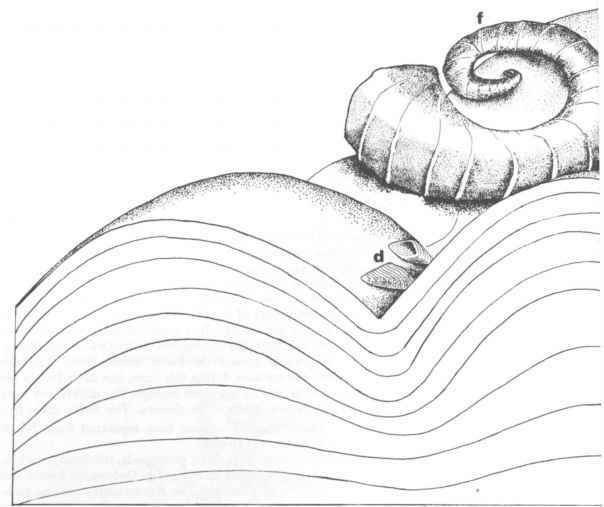 Thomas, 1965, Effect of benthic algae on stream dissolved oxygen. Journal of the American Society of Civil Engineers 91, no. SA3:1).